The formation of the Moon is a critical point in Earth’s origin. The geochemical relationships between the two bodies reflect the linkages between formation processes and chemical evolution of planets. For the past several years, Sarah Stewart’s group and collaborators have been working on the problem of the origin of the Moon. Previous models could not successfully explain the chemical differences and isotopic similarities between the Earth and Moon. 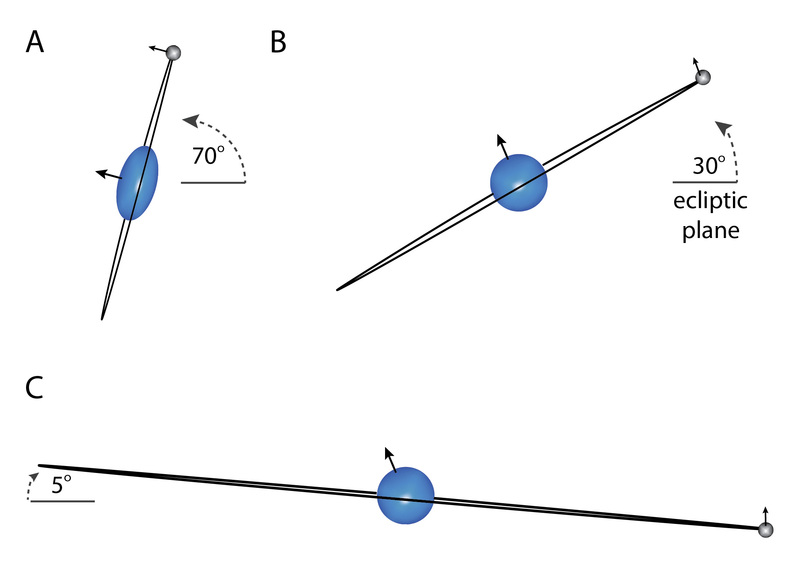 In 2012, Matija Ćuk and Sarah Stewart proposed that the angular momentum of the early Earth was larger than the present day system. If so, different types of impact events could generate a lunar disk from the same materials that formed the young Earth’s mantle. After the impact, an orbital resonance transferred angular momentum away from the Earth-Moon system to reach the present day value. However, the 2012 models were incomplete: they could not fully explain the chemistry of the Moon and the inclination of the lunar orbit. Several articles and commentary in recent years raised more questions than answers. 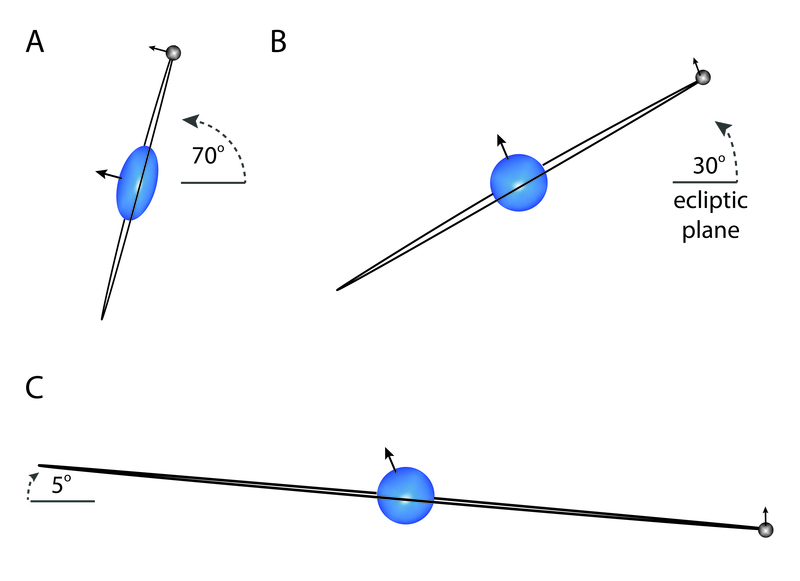 New papers have explored high-energy, high-angular momentum impact events in more detail. Ćuk et al. 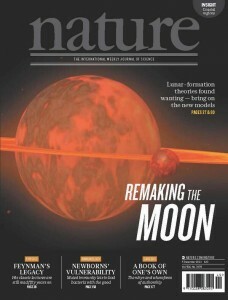 (Nature 2016) presented a tidal evolution model that transfers angular momentum and proposes an explanation for the high inclination of the lunar orbit. Lock and Stewart (JGR Planets 2017) examined the changes in the physical structure of the colliding bodies after high energy, high angular momentum giant impacts and discovered a new type of astronomical body, called a synestia. Lock et al. (JGR Planets 2018) present a model for the accretion of the Moon within a terrestrial synestia that can explain the volatile-depleted composition of the Moon. The lunar model was developed by a multidisciplinary team (physicists, cosmochemists, dynamicists) and emphasizes the crucial link between the pressure and temperature environment for the growing Moon and the composition of the Moon. In 2018, graduate student Simon Lock and coauthors present a new model for lunar origin within a terrestrial synestia. The model was developed by a multidisciplinary team of physicists, cosmochemists and dynamicists and emphasizes the crucial link between the pressures and temperatures of the environment around the growing Moon and the final composition of the Moon. This work is published in the Journal of Geophysical Research: Planets (a preprint is on arXiv). The model was developed by Simon Lock, Sarah Stewart (planetary physics), Michael Petaev and Stein Jacobsen (cosmochemistry), Zoë M. Leinhardt, Mia T. Mace, and Matija Ćuk (planetary dynamics). The Moon accretes within a synestia, a special type of astronomical body that is created by a giant impact. Initially, the synestia is larger than the Moon’s orbit. As the synestia cools and contracts, the Moon emerges and becomes a separate body in orbit around the synestia. Eventually, the synestia cools to form the Earth. The Moon’s chemistry can be explained by formation at the high pressures and temperatures of the synestia. Image by Sarah Stewart. Modified from NASA PIA 20700. Graduate student Simon Lock and Sarah Stewart describe a new type of planetary object that is created by a giant impact: a synestia. This structure is not like a planet or a traditional planet with an orbiting disk, it something distinct that has different internal structure and dynamics than other planetary objects. This work is published in the Journal of Geophysical Research: Planets and posted on arXiv. Where did the word synestia come from? The name synestia means connected structure. The word is derived from Hestia, the Greek goddess of the hearth, home, architecture and syn means together. The initial shape of an impact-generated synestia is a biconcave disc. A synestia will change shape as it cools over time. Matija Ćuk, Doug Hamilton, Simon Lock, and Sarah Stewart published a new model for the tidal evolution of the Moon: Tidal Evolution of the Moon from a high-obliquity, high-angular-momentum Earth, Nature, published online October 31, 2016. Open access ReadCube version of the paper. The model begins with a giant impact that tilts the Earth’s spin axis between 60 to 80 degrees from the ecliptic and leaves the Earth with a 2 to 3 hour day. Thre is about a 30% probability that a giant impact would leave the Earth tilted in this range. From this initial state, the Moon has two dramatic stages of evolution, illustrated in the cartoon and movies below. Viewing the Earth-Moon system from the Sun in the plane of the solar system (ecliptic plane). A. After the giant impact, the moon forms in the Earth’s equatorial plane with zero inclination. The obliquity of the Earth is 70 degrees from the ecliptic plane. The Earth is spinning so quickly that its equator is twice the length of its pole (2 to 3 hour day). B. After the Laplace plane transition (Video 1), angular momentum is transferred away from the Earth-Moon system and the Earth becomes spherical. The Earth’s obliquity is near present day, 23.5 degrees and the inclination of the Moon’s orbit is 30 degrees. C. After the Cassini state transition (Video 2), the Moon’s orbit is lowered to the present-day 5 degrees from the ecliptic plane. Caption: Animation of relative orientations of Earth’s spin and the Moon’s orbit during the Laplace plane transition, following the simulation plotted in black in Fig. 1 of Cuk et al. 2016. The system is seen from the direction of Earth’s vernal equinox, the blue arrow is plotted along Earth’s spin axis and points to the north, while the lunar orbit is plotted in red. Initially the Earth has a high obliquity, the Moon has low inclination and the Laplace plane is close to Earth’s equator. As the animation progresses and the lunar orbit grows due to tidal dissipation, the Laplace plane shifts to the ecliptic plane (horizontal in this view). The moon acquires a large inclination during the Laplace plane transition, while Earth’s obliquity decreases. The labels show time, Earth’s spin period, total angular momentum (scaled to the present value) and angular momentum of the Earth-Moon system where only the ecliptic component (i.e. that along the vertical axis) of the lunar orbital momentum is taken into account. Unlike total angular momentum, this ecliptic component will be conserved during the Cassini state transition. Caption: Animation of relative orientations of lunar figure and orbit during the Cassini state transition, following the simulation plotted in Fig. 4 of Cuk et al. 2106. The Moon is seen from the direction of the ascending node of lunar orbit, with the ecliptic plane (i.e. the Moon’s Laplace plane at this time) parallel to the horizontal axis. The red arrow shows the orientation of the Moon’s orbit normal. At first the Moon’s orbit normal and spin axis are on the same side of the normal to the ecliptic, indicating that the Moon is in Cassini state 1. Once the Cassini state 1 is destabilized, after some wobbling, the Moon settles in a non-synchronous state somewhat similar to the Cassini state 2 (with the orbit normal and the spin axis being on opposite sides of the normal to the ecliptic). During this time both the inclination and obliquity (which is forced by inclination) are being damped by strong obliquity tides. At the semimajor axis of 35.1 Earth radii, the Moon becomes synchronous again and enters the Cassini state 2, where it stays for the rest of the simulation (this event is visible as a 5-degree jump in obliquity). Is this still the Giant Impact model? Yes but …..
Our model for the origin of the Moon still begins with a giant impact. But we have changed everything about the event from what is found in textbooks today. The energy is larger (by about a factor of 10 or more), the angular momentum is larger (by about a factor of 2), the tilt of the Earth is larger (between 60-80 degrees, instead of near the present-day 23 degrees). 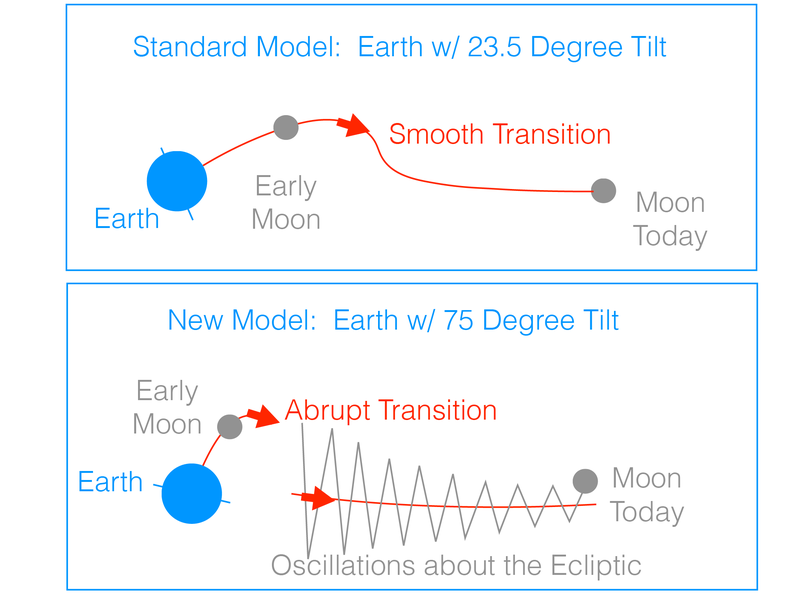 One of the elegant features of our model is that a single event leads to the unique chemical relationship between Earth and the Moon, the present length of day (angular momentum), and the present inclination of the lunar orbit. What’s changed from the previous models? SETI: Did Early Earth Spin on Its Side? Christian Science Monitor: Did the moon help turn Earth right-side up? Obliquity tides result from the apparent North-South motion of the Earth as viewed from the Moon. Figure from Matija Ćuk (not to scale). For a synchronously rotating moon with a non-zero obliquity the tidal bulge moves North-South once every orbit. Normal tides cause the Moon’s orbit to increase and Earth’s day to decrease. A new study by Kun Wang and Stein Jacobsen finds a very slight difference in potassium isotopes between the Earth and Moon. The new measurements find that lunar rocks are slightly enriched in the heavy potassium isotope. This work supports the moon formation model by Lock et al. (see LPSC presentations below), where lunar material condenses from Earth vapor after a high-energy, high-angular momentum giant impact. Wang, Kun, and Stein B. Jacobsen. “Potassium isotopic evidence for a high-energy giant impact origin of the Moon.” Nature 538.7626 (2016): 487-490. An artist’s rendering of the two recent models of the origin of the Moon and their implications for K isotopes. (Fig. from Wang & Jacobsen 2016). Lock S. J., S. T. Stewart. Lunar and Planetary Science Conference 47, Abs. 2856, 2016. Lock S. J., S. T. Stewart, M I. Petaev, Z. M. Leinhardt, M. Mace, S. B. Jacobsen, M. Ćuk. Lunar and Planetary Science Conference 47, Abs. 2881, 2016. Petaev, M. I., S. B. Jacobsen, S. Huang, S. J. Lock, S. T. Stewart. Lunar and Planetary Science Conference 47, Abs. 2468, 2016. Huang, S., M. I. Petaev, W. Wang, S. J. Lock, Z. Wu, S. T. Stewart, S. B. Jacobsen. Lunar and Planetary Science Conference 47, Abs. 2261, 2016. Jacobsen, S. B., M. I. Petaev, B. Boatwright, S. J. Lock, S. T. Stewart. Lunar and Planetary Science Conference 47, Abs. 2713, 2016. Ćuk, M., S. T. Stewart, S. J. Lock, D. P. Hamilton. Lunar and Planetary Science Conference 47, Abs. 2489, 2016. The previous models and outstanding issues are summarized below. New data and models collide and produce uncertainty about the giant impact hypothesis. 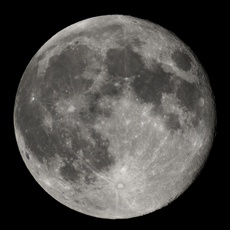 Commentary by Sarah and others in a Nature online special describe the outstanding issues related to The Origin of the Moon. Jay Melosh discusses the major problems for lunar origin in New approaches to the Moon’s isotopic crisis. 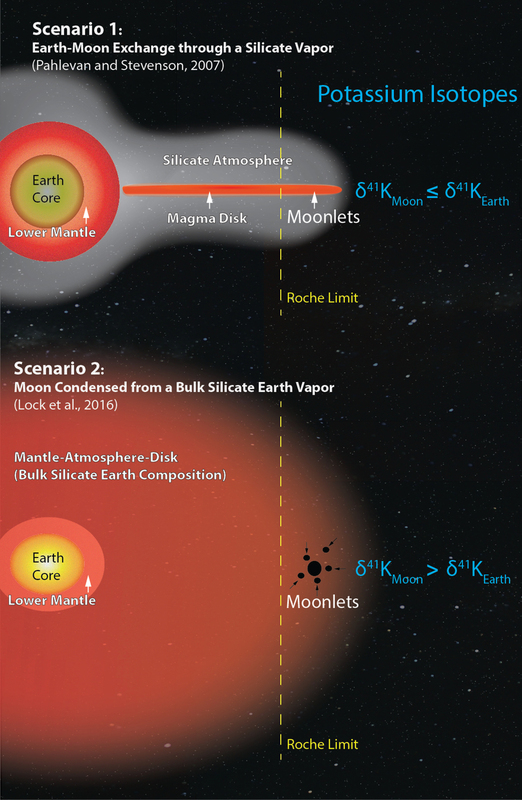 The nearly identical oxygen isotopes for the Earth and Moon was re-affirmed by Ed Young and colleagues in Oxygen isotopic evidence for vigorous mixing during the Moon-forming giant impact. Making the Moon from a fast-spinning Earth: A giant impact followed by resonant despinning by M. Ćuk and S. T. Stewart. Forming a Moon with an Earth-like composition via a Giant Impact by Robin Canup. The Origin of the Moon, a perspective by Alex Halliday. Matija Ćuk and Sarah Stewart propose a new model to explain the remarkably similar chemistry of the Earth and Moon. A giant impact onto a fast-spinning Earth ejects material from Earth into orbit, which forms a Moon that is depleted in iron and has a composition similar to Earth’s mantle. After the impact, the rapidly rotating Earth is slowed down by a gravitational interaction between the Sun and the Moon called an orbital resonance. The leading theory for the origin of the Moon is a giant impact with the young Earth. Recently, the hypothesis has been called into question by measurements that find that the Earth and Moon the same isotopic composition (isotopes of an element have slightly different masses). The isotopes of oxygen and titanium, for example, vary widely in the Solar System and are used to ‘fingerprint’ different planets and meteorite groups. The data show that the Earth and Moon are ‘isotopic twins’, but the original giant impact model predicted that most of the Moon was made from the body that struck Earth, which should have had a different isotopic fingerprint. Therefore, the original giant impact model has a major problem: it can match the mass of the Moon and the rotation rates of the Earth and Moon, but not the chemistry of the Moon. Today, tides between the Earth and Moon slow Earth’s rotation and push the Moon’s orbit further away, but the total angular momentum (see glossary) is conserved. Going back in time, the early Earth had a day of only 5 hours when the Moon formed. With a post-impact spin period of about 5 hours, a giant impact could not loft enough Earth material into orbit to make the Moon match the chemistry of the Earth. Ćuk and Stewart show that if Earth’s initial angular momentum were higher, corresponding to an Earth day between 2 and 3 hours, a giant impact can eject enough Earth material into orbit to make a Moon with the same isotopic fingerprint. A day of only 2 hours is near the point when the Earth would begin to fly apart from rotational forces. When the Earth is spinning near this rotation limit, it is much easier to launch Earth material into orbit during a giant impact. Furthermore, Ćuk and Stewart found that the early Earth can have a shorter spin period after the giant impact and then later reach the present spin by transfering angular momentum to the Sun through the ‘evection’ resonance. The evection resonance is a gravitational interaction between Earth’s orbit around the Sun and the Moon’s orbit around Earth. This new work shows for the first time that it is possible for the early Earth to have had a spin period of only 2 to 3 hours after the giant impact. Now, the giant impact followed by an orbital resonance between the Moon and Sun can explain the chemistry of the Moon and the rotation rates of the Earth and Moon. Earlier scientists speculated about a fast-spinning early Earth. In 1879, George H. Darwin, a son of Charles Darwin who studied tides, suggested that the Moon formed by fission from the Earth (spinning off material from the Earth), but he did not know how to make the early Earth spin so quickly. Modern studies of planet formation show that Earth grew by a series of giant impacts that made the early Earth spin near its rotational stability limit of about 2 hours. The last giant impact formed a Moon that is a twin of the Earth. Calculations of the giant impact event model the collision itself and the generation of a stable disk around the Earth over a period of about 24 hours. The methods used for this stage of Moon formation are not able to model directly the formation of the Moon from the disk, a process which occured over 100’s of years as the hot disk cooled. A candidate Moon-forming disk is one that has enough mass and angular momentum to make a satellite the mass of the Moon at the Roche radius (about 3 Earth radii, the distance where a satellite is not broken up by tidal forces). The Moon is 1.2% the mass of the Earth and the disk typically has about twice the mass of the Moon. In the animation, Earth and the smaller planet that hit Earth, named Theia, are represented by many particles with a fixed mass, shown as small balls. The color of the ball indicates the material: iron cores and rocky mantles. Before the impact, Earth’s shape is an oblate spheroid because the day is only 2.3 hours long. In this potential Moon-forming impact, Theia has half the mass of Mars and strikes at 20 km/s. Theia penetrates all the way to the core of the Earth and throws material out, temporarily forming a deep hole in the planet. Theia and part of the Earth are vaporized and expand around the planet. Some material is ejected quickly enough to escape the Earth. The final disk is massive enough to make the Moon and composed primarily of material from Earth (green balls). The disk has almost no iron as Theia’s iron core merges with Earth’s core. This impact scenario agrees with the observed the masses of the Earth and Moon, the low iron content of the Moon, and the similar isotopic composition of the Moon and Earth’s mantle. After the impact, the Earth has a day of 2.7 hours. This animation shows the lower hemisphere of the two colliding planets cut through the equator of the Earth. Each planet is represented by many particles with equal masses. The colors show the iron cores and rocky mantles. In this example, the growing Earth, with a 3.1 hour spin period, is hit by a Mars-mass body at 9 km/s. Because this impact is slower and more oblique compared to the case shown above, a portion of the projectile shears during the initial contact and sends a spiral arm and fragments into orbit around the Earth. Some large fragments impact the Earth and some remain in orbit. The final disk is massive enough to make a satellite as large as the Moon, but about 60% of the disk originated from the impactor’s mantle (yellow balls). Thus, this disk is unlikely to make a Moon with the same isotopic signature as Earth. A top down view of the Moon’s orbit around the Earth, with the Sun’s direction fixed to the right. The red line shows the orbit of the Moon as it evolves through Earth tides and the evection resonance. 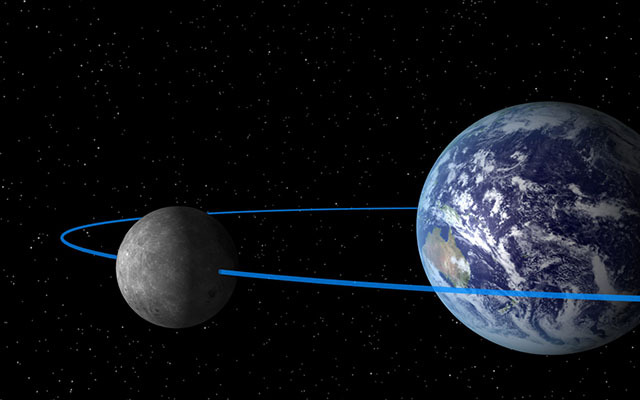 After the giant impact, the Earth-Moon system had more angular momentum than present day. After the Moon forms from the disk, the Moon’s orbit begins to expand outward through tidal forces. The Moon is soon caught in the evection resonance, which fixes the closest point in the lunar orbit to be 90 degrees from the Sun. While the Moon is caught in the resonance, typically for several 10,000 years, the Earth is transferring angular momentum to the Moon via tides. But the Moon cannot absorb the angular momentum while it is caught in the resonance. Instead, the Moon passes the angular momentum to the Sun through the resonance. As a result, the Earth’s orbit around the Sun expands slightly. After the Moon breaks out of the resonance, its orbit continues to migrate outward through normal tides with the Earth. Today, the Moon orbits at about 60 Earth radii. While caught in the evection resonance, the Moon would have appeared almost 20 times larger in the sky during its closest approach to Earth. Angular momentum is an expression of an object’s mass and rotational speed. Angular momentum is conserved, which means that the total angular momentum of a group of objects remains the same over time. Angular momentum can be transfered from one object to another. An orbital resonance is periodic gravitational interaction between two planetary bodies. The evection resonance occurs when the period of the precession of the lunar orbit equals one year, the period of Earth’s orbit around the Sun. In the resonance, gravitational interactions between the Moon and Sun fix the orientation of the Moon’s orbit to the Sun (see animation at bottom of page).